What is the Golden Age and How Do We Get There? The Golden Age begins with you! As you purify your consciousness, being and world, you are able to hold more of the Light and Consciousness of your own God Presence and of the Ascended Masters, becoming a pillar of Light on the Earth. As the Sons and Daughters of God rise into their True Identity - God Individualized - anchoring the Golden Age of One in their own life, the Earth will accelerate in vibration and emit more Light each day until she radiates her own Self-Luminous Brilliance and shines triumphantly as Freedom's Star! On October 11, 1998, Beloved Vesta said: "For Victory is here, and there is a New Day and the Golden Age has come into manifestation as we stand. For you are the beginning. You are that Spark of Light that will light and ignite the world. And you will carry my Torch and my Fire from the Heart of Truth and the Heart of the Sun." The Golden Age is not just a whimsical fancy born out of an optimistic imagination. No! It has ever existed and continues to exist in the Realms of Eternity. It is the ongoing Divine Reality that is the moment-to-moment existence of your own God Self. To have the Golden Age manifest where you are, all you need to do is to attune with your Divine Mind and see the Reality that is already right before you! What does a Golden Age look like? Let's look to the Golden Ages of the past. 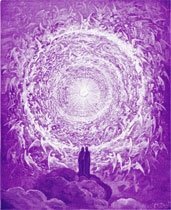 The Ascended Master Saint Germain, who stands as the Hierarch of the Dawning Golden Age, was involved in several of the Golden Age civilizations of the past. One occurred more than 70,000 years ago in the Sahara Desert, when this now-barren landscape enjoyed a semi-tropical climate, abundant water, and fertile land. 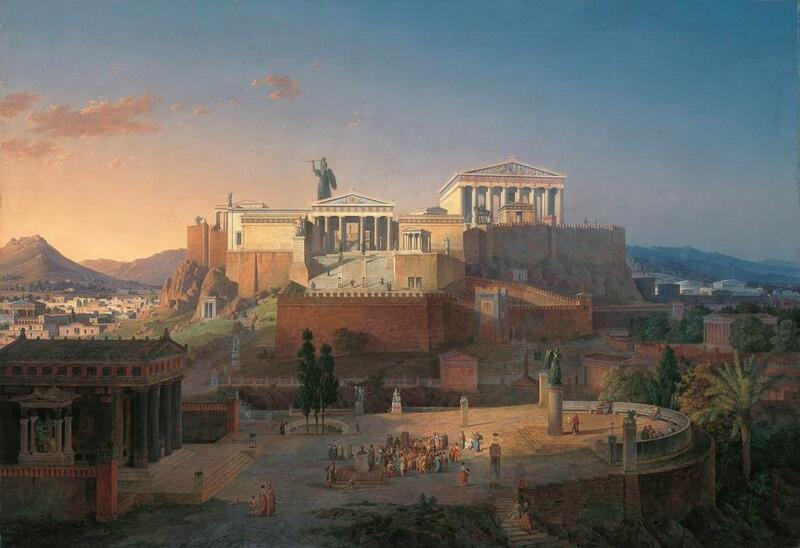 The capital city was known for its splendor, with many golden-domed buildings. The people of this civilization knew only peace, prosperity, and happiness. They were governed by 14 Ascended Masters and 14 lesser Masters who presided over that civilization's industry, science, and art. The more spiritually advanced people of this Golden Age civilization traveled in their finer bodies, free of gravity. Gold was a common commodity, utilized for its purity, balance, and vitality. The people wore garments made of soft, radiantly colored fabric. They moved with grace and poise, self-assured and confident in their Divine Identity. Each person had a commanding Presence about them, and the very air around them crackled with the electrical charge that their Presence directed through the outer expression of Itself. So how did this Golden Age come about? During this age of enlightenment and Freedom, the Sons and Daughters of God acknowledged and adored the Mighty I AM Presence as the Eternal Source of all Life. The outer self was but the chalice or vehicle for the Divine Will of the Great God Self to manifest through the supreme act of the I AM command of creation. All creation was a pure outpicturing of the Patterns of Perfection held within the Mind of God. The outer self was in complete obedience to the God Presence within, and the Consciousness of the Emanation of the Pure Essence of God flowed forth free of any human misqualification. And who will bring in this Golden Age? The Great God Self acting through you and - heart by heart - all unascended mankind will anchor the Golden Age in the Earth! By bringing the Ascended Realms into this world of form and securing that Light into the earth planes, the outer world will become one with the Divine World, and the Golden Age will outpicture increment by increment! It all begins with you! The Ascended Masters call this the Golden Age of One. This means that each individual forges their own life into a Golden Age of One by remolding and reshaping every element of their personal lives into the Perfection of God. You as an individual will learn to detect the Vibration of your Holy Christ Presence in its own native Purity and Perfection. As you grow closer to your Holy Christ Presence, you will find that your Holy Christ Presence begins to enfold and occupy your aura. You will have a sense of peace and protection that nothing can interfere with. 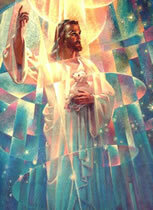 As you become more comfortable operating as your Holy Christ Presence, you will begin putting on the Golden Age of One. And you will understand how your Holy Christ Presence is projected, sustained, and magnified by the Mighty I AM Presence that is your innate Divinity. So how do you start bringing in the Golden Age of One? For one, examine the things you allow into your consciousness, the things that you allow to surround you, the words that you speak, the deeds that you carry out, the way you present yourself to others. Ask yourself: Are they worthy of the Christ? Are they reflective of the virtues of the Christ? Are they of the highest Vibration of the God Qualities and the Seven Rays that stream forth from the Heart of your own God Presence? As more and more individuals manifest the Golden Age of One, the Golden Age culture will predominate on Earth. Music, literature, entertainment, clothing, and recreation will all mirror the Divine Realms where the Ascended Masters have their Retreats. Everything that you see, hear, and experience will reinforce the image of a Firstborn Son or Daughter of God. Mankind will be inspired by divine melodies, inventions, politics, and literature. People will attune with Nature to engage her cooperation in bringing in this Golden Age. All will be involved in the great creative process of becoming the God Self that we already are in Reality. When we become Divine Love in action, we will start the process of bringing in the Golden Age on this Earth, anchoring the Perfection of God right where we are. If we uphold Purity of mind, heart, and body, an Age of Beauty and Perfection will be the permanent Reality for this and future generations. Reclaim your Divine Inheritance, manifest your Divine Blueprint for this life, and create a personal Golden Age for yourself as you help Saint Germain manifest his Golden Age for the entire Earth! This article is copyrighted © by The Temple of The Presence®.